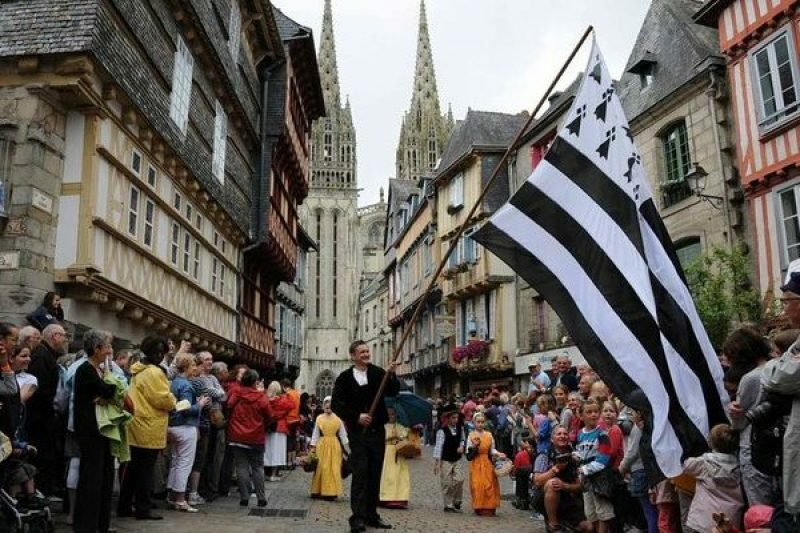 Twinned with Limerick, the ancient town of Quimper is arguably the most traditionally Breton large town. For its charm and liveliness, its well worth a day trip if you happen to find yourself within a couple of hours’ drive of the place while on holiday in France. A lot of people come to sample the modern atmosphere set against a very quaint setting full of half-timbered houses, wooden bridges and its centrepiece cathedral (La Cathédrale Saint-Corentin) that dominates the large Place Corentin. As one might deduce from a town of its size (about 63,000 inhabitants at last count), there are more than two markets in Quimper, but the two main ones are the appropriately named Grand Marché and the Les Halles Saint-François. The Grand Marché is the signature open-air market that takes place every Wednesday and Saturday throughout the year with a minimum of 100 stalls that extend along the leafier end of the Quai du Steïr in a part of town that has a little hint of Venice about it. All year round, there are food stalls, while the emphasis on manufactured goods is greater during the warmer months. The food market runs from 08:30 to 13:30 and an extended version of manufactured produce runs from 08:30 to 19:00 from the 1st of April to the 30th of September, with an earlier 18:00 closing time the rest of the year. Over on Rue Astor, meanwhile, the daily covered market of Les Halles Saint-François is a Quimper institution that has been around since 1847, having been purpose-built on the site of an old Franciscan convent. It boasts a diverse range of produce of a largely edible variety and is open daily throughout the year from 07:30 to 19:30 on Mondays, from 05:30 to 20:00 Tuesday-Friday inclusive, from the ungodly hour of 04:30 to 20:00 on Saturdays and from 07:00 to 13:00 on Sunday. In addition, there is the Marché Biologique on Boulevard des Frères Maillet (in the car park) for a more bric-a-brac approach from 07:00 to 14:00 every Sunday and the similar pop-up style Marché du Braden on Place Victor Schoelcher (same opening hours).